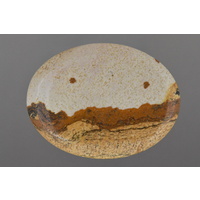 Chinese Picture Jasper is sedimentary rock and the colors are dependent on the minerals in the area where it was formed. A major factor in the design is as the silt from ancient rivers and lakes settle the water enriched with various minerals, manganese and iron and various other minerals and sometimes even volcanic ash, flow and trickle down the fissures or fractures, and bedding planes between layers of silt, limestone and other rock types . 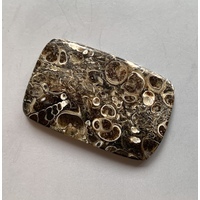 The natural patterns are embedded permanently by heat and pressure and harden into rock over millions of years into what is actually petrified mud or siltstone. The formations making the pictures and patterns is referred to as dendrite (from Greek déndron, tree). 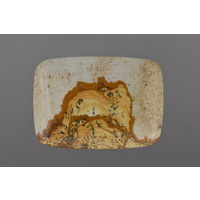 Because of the treelike features, these dendritic mineral patterns are sometimes so amazing that they have often been mistaken for fossil plants. The colors and patters are completely natural. They have not been painted or etched. They have been sliced, shaped and polished. 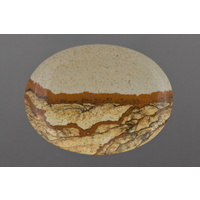 Their hardness can range from as low as 3.5 in the Mohs scale to around 6.5 in the same rock.